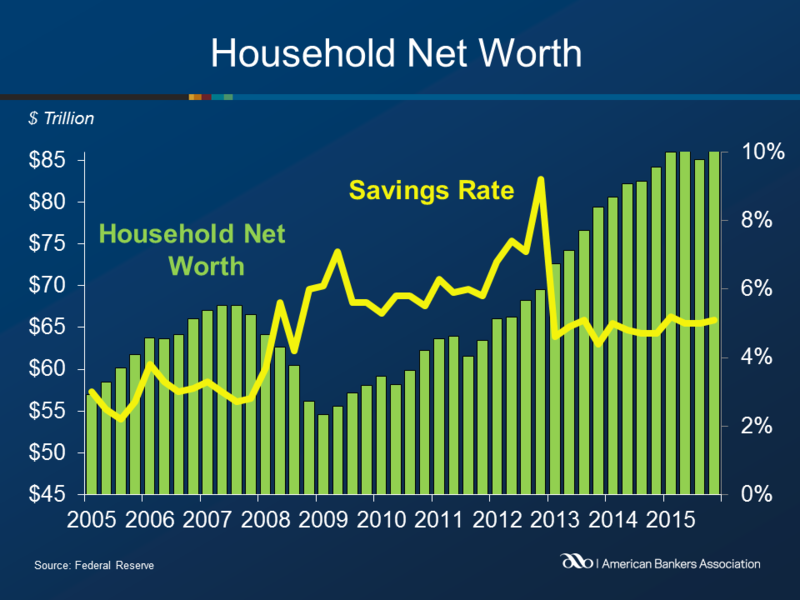 Household net worth rose $1.6 trillion during the fourth quarter of 2015 to $86.8 trillion, a 1.9 percent increase from the previous quarter and a 3.1 percent increase from a year ago. Household holdings of nonfinancial assets increased during the fourth quarter, growing 1.7 percent. The majority of this increase came from real estate holdings, which increased by $458.3 billion. Growth in wealth derived from consumer durable goods increased by $54.7 billion, compared to a $41.4 billion increase in the third quarter. Household and non-profit holdings of financial assets increased 1.8 percent from the previous quarter. The increase was largely due to increases in deposits and corporate equities, which grew a combined total of $539.9 billion during the quarter. Equity in noncorporate businesses also increased during the period. In contrast, loans decreased by approximately $25.7 billion during the quarter. Household nonfinancial debt increased at an annual rate of 3.4 percent in the fourth quarter, as consumer credit grew 5.9 percent. Mortgage debt grew at a 1.5 percent annual rate. The household savings rate rose to 5.1 percent during the fourth quarter, up from 5.0 percent in the third. Federal government nonfinancial debt increased at a rate of 18.5 percent during the fourth quarter, largely due to the restoration of funds which were depleted as part of the Treasury’s “extraordinary measures” during the 2015 debt limit impasse.